Getting ahead of the holidays with your grocery budget means you have to stock up and plan so you’ve got all you need but at a fraction of the price. I’m not sure if you noticed (I’m sure you have) that any time a holiday or seasonal change is around the corner prices tend to jump sky-high or drop on certain products many of which you may need to cook or bake with. Have you ever said, I bought that (insert product here) for $2.99 last week and have 10 in stock now while the price jumps back up to $3.99 or even higher $5.99? We have and those are the moments we are happy that we took advantage of a sale so we can put that savings towards other foods that will help bulk out our savings for the season. Often what happens is for those of you who don’t plan it may mean having to do without or buying a similar product but not the one that you really wanted. Often products that aren’t on your radar may not taste the same which means you are settling for something only because of price. It doesn’t have to be that way if you plan your grocery shopping according to monthly sales and stock up when you can. There have been a couple of times Mrs. CBB and I both made a mistake because we didn’t quite think of the aftermath of bringing home what we were going to stock up on. Having much experience with couponing and extreme sales over the years we’ve had to ask ourselves a few questions before we leave the house or before we even create our grocery list. Most often you will find what you need in the local grocery flyer for sales so you can plan accordingly but there are those times when you find “stock me now” products or you lose out on an awesome deal. This is where our stockpile budget comes into play of $25 a month but some months we sure could use a bit more and others we don’t use it as much. Can you afford it? A stockpile budget is a great way to stock up when the prices are right but outside of your every week grocery budget. How much of it do you already have? You really need to understand just how much food you need and can have before it goes off because even foods in the freezer can become freezer burnt. Nothing lasts forever. Do you have the space to stock extra food products? We built shelving in our cold room as well we have shelves in the basement to keep products organized. Are your freezers empty or full? This is very important and includes your refrigerator/freezer in the kitchen or if you have a second one in the home. Always conduct a freezer inventory list so you know what you have and take a look to see how much space you have available so you can buy accordingly. Will you have time to process all of the meat, fish, fruits and vegetables that you buy? This is a big one because they can waste so fast and typically should be done the same day you buy what you get for optimal storage and preserving. If the meat and fish you buy in bulk needs to be processed into smaller packages you must do this before freezing it. After Thanksgiving and Halloween you will find loads of sales on various Halloween or Fall vegetables that have been brought into the stores in mass quantities. These are the sales you want to jump on. Let’s have a look at the foods you should stock up on now before the holidays and then again to have enough to get you through to the next big seasonal sale in the Spring. There are always way more pumpkins than there are people buying them so grab them when you can at a cheap price after Halloween. You can process the pie pumpkins and freeze the flesh for up to one year or even longer. You can also do the same with other squash family vegetables. There is always room for potatoes in the cold room if we want to stock up so having a few bags on hand to get through the winter is ideal especially if the price is right. The grocery stores won’t hang on to them forever so if they have an over-stock from Thanksgiving they may just flog them off for cheap. Keep an eye out for sweet potatoes, yams and other root vegetables that typically are in high demand during October and November but then taper off after that. This one is hit or miss but if you like to bake whether it’s gluten-free or not stock up when you see the sale happening in October and November. You may find flour will go on sale in December but prices may be a bit higher still. We buy our almond flour at Costco which is about $15.99 for 2kg and that’s a standard price unless there is a sale in which case we might buy 2. Chocolate and winter kind of go hand in hand as it is a comfort food that most people like to have linger in their mouths. At least I do. (maybe too much information) If you want a certain kind of chocolate whether it’s for eating, melting or baking now is the time to stock up especially after Halloween when the shelves are flooded with chocolates leftover from October 31. Mrs. CBB uses Krisda Chocolate Chips that are sweetened with Stevia and run $8.99 a bag so if there is a sale, we stock up. It’s rare but we may find that chocolate sales will start ramping up before the Christmas holidays. One of our readers last week spotted a load of Bakers Chocolate and Chipits in the $0.99 bin and she took advantage and did a stock up. Boy was she lucky!! Fall and Winter spices are great to have in abundance for comfort food cooking and baking throughout the winter months. This is when you will want to find any spices that your family recipes include that you use more than normal seasonally. For example , in the winter we go through lots of cinnamon so if we find a sale especially on the cinnamon sticks we will stock up. We like to fill the house with cinnamon smell so we boil the sticks on low with some cloves and it’s wonderful. No matter what kind of sugar you use if you see it on sale now, grab it while you can. You may not have the desire to bake for the holidays just yet but if you get that urge it’s best to have it on hand without paying premium prices. Bags of sugar can go on sale for under $2 and jump to $3-4 a bag depending on the sales month. You might have noticed in October that canned and frozen vegetables are on sale quite a bit and that’s because root vegetables are at their peak and everyone is buying them up. This is the time you want to stock up and have a nice stash of vegetables for the winter when you WILL see prices skyrocket in Canada . Canned and frozen are just as good as fresh when it’s the frugal option. October just after Thanksgiving is the time you will want to buy fresh cranberries from the produce section of the grocery store and freeze them. If you have the time you can process your cranberries now and have them ready in jars for later. Not much to say about butter but buy it when you can, while you can or watch the price double! We often stock up at $2.99 and cringe at $3.99-$4.99 IF we need to buy it. We don’t use margarine in the house and if we had to, we’d do without. You can freeze butter for up to 6 months without issue and easily defrost it on your counter or in the refrigerator when needed. Dried beans last a long time so if you know you like to eat lots of hummus or chickpeas are part of your daily diet and you see a sale in October and November, stock up. I find that dried beans tend to go on sale during these months as they are the bulk of the comfort food meals that we make during the winter. Buy off sale and you’ll see the prices jump. Buy it now before Thanksgiving if you find a sale or after Thanksgiving when the grocery store is trying to get rid of them. We bought a PC Spiral ham for 50% and had it ready to go. Bacon is great for appetizers, brunch and pretty much any meal of the day especially if you eat a keto diet like Mrs. CBB does. Bacon is pricey and can get even pricier when you need it the most. Running at near $7 a pound if you find it for $3 or less, stock up while you can and freeze it. Cheese no matter what time of year is always expensive so we are constantly on the hunt for deals but don’t always find them when we want them. That means we either pay premium prices or go without. We’d rather have our cheese as we love it and everything tastes better with cheese, right? When a sale comes up in October and November on cheese bars for $3.99 don’t be afraid to buy 10 bars as it will be fine in your refrigerator for months. You can also freeze it but it breaks into chunks and you won’t be able to grate it after but it is an option. Nut prices are just as nutty as butter prices in the Fall and Winter so if you see a sale and you will think ahead of your baking needs for the winter months. If you are someone who uses cashews, almonds, peanuts, walnuts, pecans or any other pricey nuts take advantage of sales or any coupons combined with a sale that may offer you grocery savings. We don’t use dried fruits as much but as the winter months approach many people ramp up their holiday baking where dried fruits are used quite a bit. This is a big time for the dried fruit industry as other months during the year will be slower so expect higher prices on dried fruits. If you find a sale, stock up and they will last you a while since they are dried. Beverages aside from the food can get costly during the holidays and throughout the seasons so stock up when you can get a good sale. If you see a case of pop for $3.99 or even less that’s a great deal. Keep your eyes open for sparkling water, juices (pineapple, cranberry) especially as they are great for mixed drinks. You might even get lucky and find deals at the local LCBO and Beer Store on beer, wine and spirits that you can buy before any gatherings so you’re not paying premium prices. Keep in mind if milk is on your list of beverages you can freeze it which is what we do since we go through so much of it. When we get 20x the points at Shoppers Drug Mart we jump on that sale and stock up. You get enough points back so that one full bag is FREE!! Going for the stock up isn’t for everyone but if you have a grocery budget that you are trying to balance and know you can save today for tomorrow then I’d suggest you go for it. The best part is you won’t have to cringe when you see the food item you need at a far more inflated price. 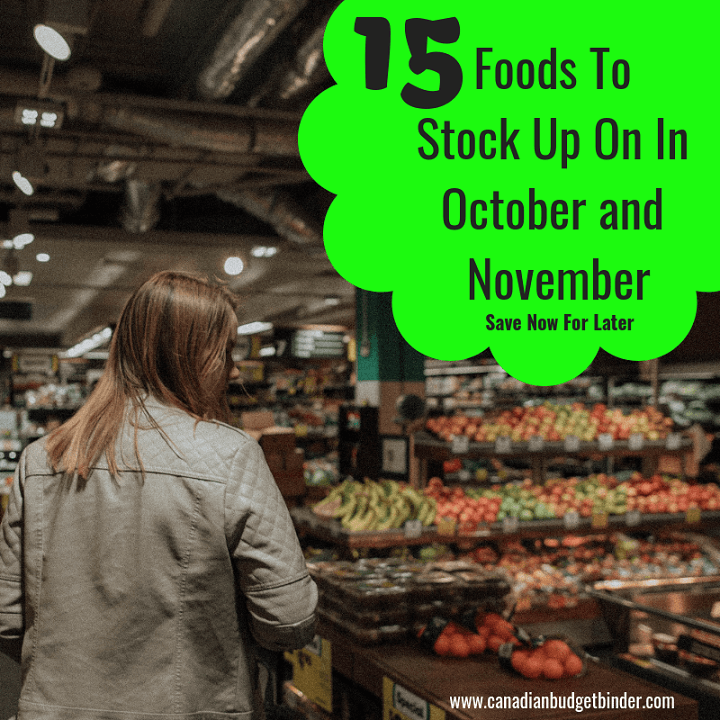 Discussion: What other products do you stock up on in October and November for your meal planning? PC Split chicken wings $6.10 – 50%=$3.05. This was one of those unplanned shops that we made only because we knew there would be deals right before the Thanksgiving holiday. In light of that we made no grocery list but had somewhat of a budget idea of how much we could spend. I’d say we did damn good considering all of the deals we found saving us $115.00 mainly on meats and cheese! We had a major stock up, I’d say. We did pick up a few staples but for the most part our meals this week will be based around what we purchased for 50% off. Order your online groceries from Walmart Canada and enjoy this $10 from Me To You for first time shoppers! Bank Error Cost Us BIG NSF Charges- Don’t make this mistake! I’ve only just started reading this blog but my first time in the grocery store after reading some of your tips I started saving immediately!!! I checked out the coupon board and found $4 worth that I could use; I suddenly noticed the glowing pink reduced signs like never before; noticed HUGE bags of carrots, beets and potatoes on for super cheap (your ‘What to look for in October’ tip and actually started to pay attention to prices of things. In just one week I’ve saved about $12 in reduced prices and coupons. Wow! i’m impressed. I always thought I was a good shopper, but realize now I can be much more savvy when picking up groceries. Thanks so much for running this blog. It’s a lot of work, but so worthwhile to so many people. Best country in the world? Just want to comment that the veggie box I have beeen receiving for total of 18 weeks has not only kept us almost completely in fresh veggies since the beginning of June but it has challenged us to try new varieties and recipes and has given me a healthy stock in the freezer of tomatoes kale squash cabbage and mixed peppers for winter soups and stews. It has also allowed me to share with my daughter and her kids and a friend. I will definitely do this again.. Thanks Mary, That’s what I get for rushing my numbers at the end. I’ve adjusted it to $1.00 not $100 lol. Mrs. Would kill me if I did that. How much do you pay for your veggie box? Has there been anything you don’t care for in it? It’s getting dark earlier, raining more frequently and just not my favorite time of year. Thanksgiving is behind us now so next up…we’ll be celebrating our wedding anniversary. It’s hard to believe another year has flown by! OUR NEXT USA SHOP WILL BE IN 2019! OUR CURRENT TOTAL UNUSED RESERVES ARE $1,925.98. This means the 1,761.30 that we carried forward from 2017 PLUS AN ADDITIONAL $1,818.86 that we have added in 2018, LESS $1,654.18 that we have drawn out for use in 2018.